San Francisco’s food scene has never been more dynamic. Most tourists are here to sample the fresh seafood but there’s a lot more to on offer from the City by the Bay. Did you know there’s a burgeoning coffee culture? From local institutions to up and coming hotspots, here’s my foodie guide to San Francisco. Follow this and trust me, you’ll never go hungry and you’ll need every inch of stomach space. San Francisco’s most popular tourist spot is the Fisherman’s Wharf. Many Italian immigrant fishermen and their families settled here in the late 1800s and the area is still the home base to many active fishermen and their fleet. Fresh seafood straight from the bay, the Dungeness Crab in particular, is what most visitors come here for. 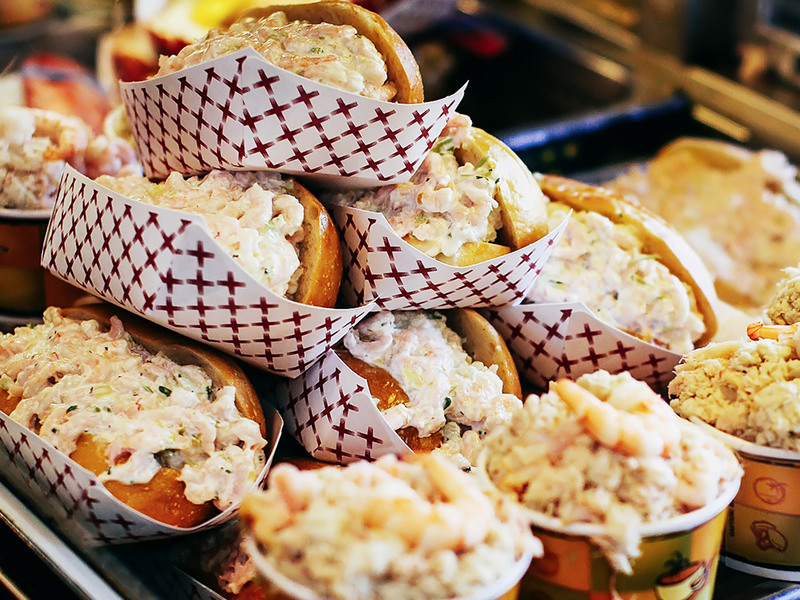 You can taste this sweet crab meat at any of the seafood stands along the wharf or grab the popular clam chowder served in a bread bowl at Boudin Bakery, which is also famous for its sourdough and has a fun glass walled kitchen so you can watch all the kneading action. Keep strolling along the historic wharf to see the sea lions basking on docks at Pier 39. The pier is is filled with shops and restaurants. 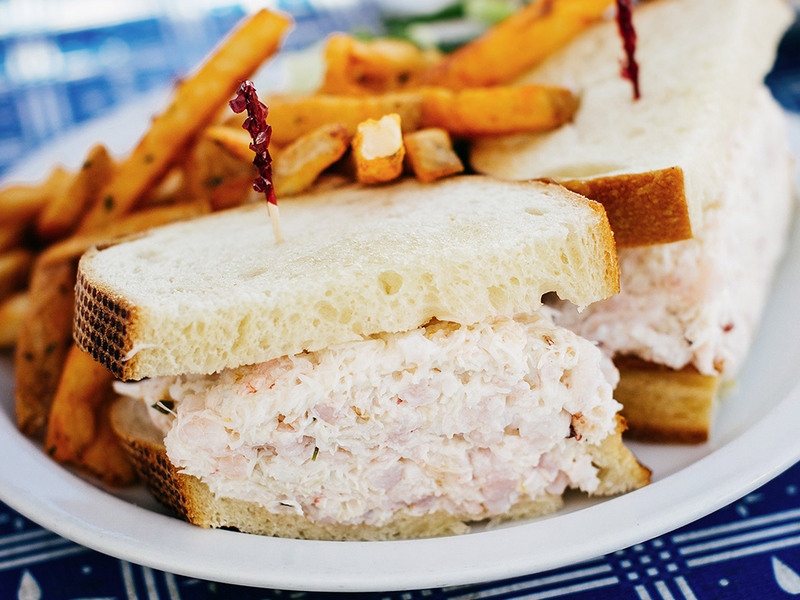 Try to avoid the tourist traps and head further to Pier 23 Cafe for some freshly shucked oysters and a classic crab and shrimp sandwich. The al-fresco dining deck offers a great view of the Golden Gate Bridge, Angel Island, Alcatraz and the Bay Bridge. From here jump on the MUNI F-Line Streetcar to Ferry Building Marketplace where you’ll find a vibrant gathering of local farmers, producers and independently owned and operated food businesses waiting to tantalise your tastebuds with their amazing local artisan products. There’s also a fabulous farmers market on Tuesday, Thursday and Saturday until 2 p.m.
A trip to America simply isn’t complete without smashing down a burger or two. There are a few small burger chain burgers in San Fran which are definitely worth checking out. Gott’s Roadside at Ferry Building has that old school diner charm. Their cheeseburgers are made-to-order using top-notch, locally sourced ingredients. Try the Green Chile Cheeseburger, which comes with a whole grilled Anaheim Chile and some charred jalapeño mayo – it’ll have you dancing the Macarena. Super Duper Burgers is a fast food-style burger chain that actually knows how to make a real burger. 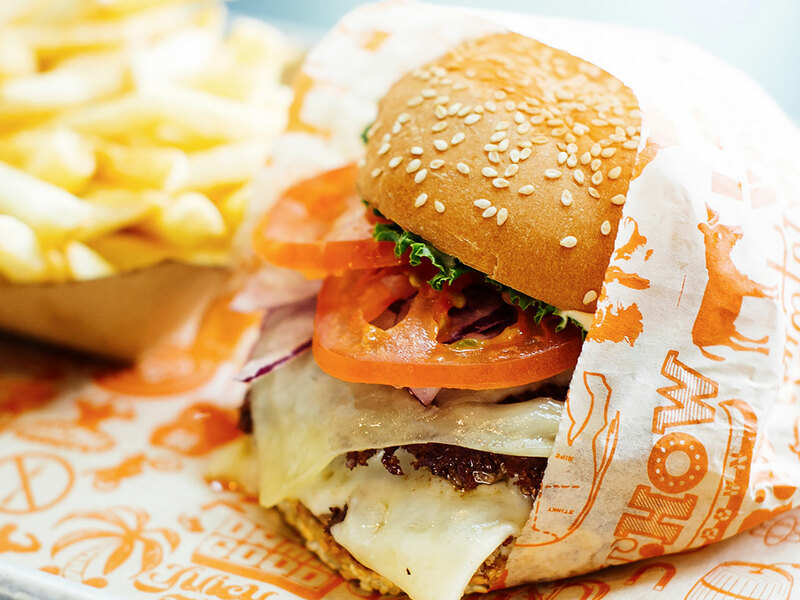 The juicy cheeseburgers are cooked medium with Slow Food values, using all-natural beef and locally sourced ingredients. The burgers here are bigger than most places, and within one bite you’ll have burger grease running between your fingers. It’s big on flavour and definitely bang for your buck. If you want to DIY your burger, check out Roam Artisan Burgers where burgers are constructed exactly how you want them. Along with the usual beef patties, you can also choose from turkey, bison or even elk meat. Try their popular bison burger if you’re after a lean, healthy alternative. Coffee? In the States? Don’t even go there. It’s common knowledge good coffee is hard to come by in this part of the world but you’d be surprised how things have changed in the past decade. The coffee culture in San Fran has flourished in recent years, with skillful coffee artisans and roasters keeping the coffee snobs buzzing around the Bay Area. Established here in the Bay Area of Oakland, California, Blue Bottle Coffee Company has taken over America by storm. It now has outlets all over the country, even making an appearance in Tokyo, Japan. Inspired by the origins of coffee in Vienna, their mission is to offer customers coffee at the peak of its freshness (within 48 hours) using the finest single origin beans. The people behind Four Barrel Coffee pretty much live and breathe coffee. 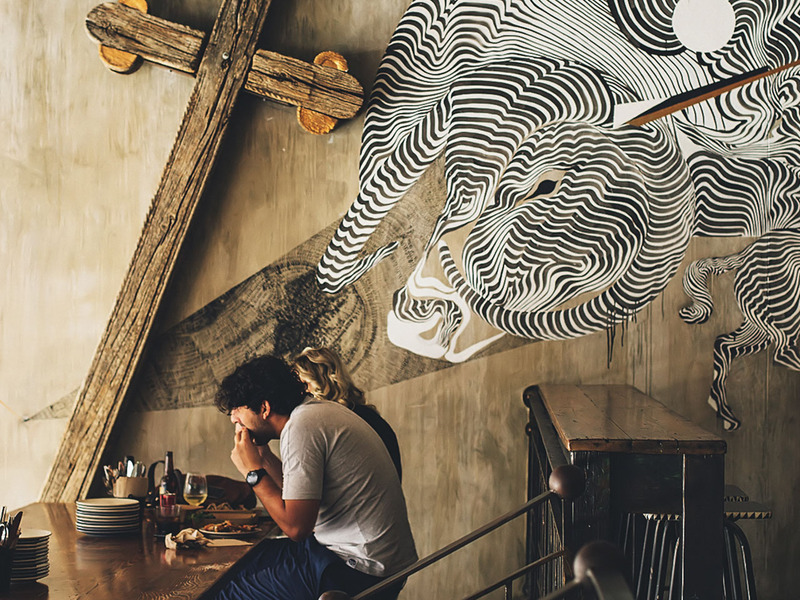 Coffee aficionados (and Melbournites) will instantly feel at home with the industrial yet rustic décor and the bearded barista who knows coffee like the back of his hand manning the machines. If you’re in no rush, take a seat at the pour over bar where coffee drips slow and listen to the team chat about the science of coffee. Housed inside a massive warehouse space, the hipsterific Sightglass in Mission is where the real San Fran coffee snobs hang out. With two espresso machines running simultaneously, the intoxicating coffee aromas fill the air while the on-site roaster humming in the background is like music to your ears. The coffee costs a little bit more, but will certainly hit the spot. It took Phil Jaber 25 years of experimentation before he perfected 30 blends of coffee and opened Philz Coffee in SoMa. You won’t get espresso coffee here as they pride themselves on executing the perfect pour-over method. Philz Coffee is a great spot to catch up on a few emails or people watching with a simple cup of drip coffee. It’s colourful, it’s quirky, it’s personal. Pinhole Coffee is that cute little coffee corner where you just want to sit and sip the day away, admiring the art on the wall and letting the conversations flow. The food scene in San Francisco is both creative and diverse. Who said food can’t be fun? If you’re looking for something a little different for a romantic date night, Foreign Cinema in the lively Mission neighbourhood might just be the answer. As the name suggests, foreign films are screened on the wall of this beautiful outdoor restaurant, with hanging lights twinkling overhead. The daily changing California/Mediterranean-inspired menu is unpretentious and inventive. It’s a quintessential San Francisco dining experience. Mission Bowling Club is a fun place to hang out with a group of friends while trying tasty cocktails and knocking a few pins down. This hip and retro establishment also has a full-service restaurant at the front serving upscale comfort fare. Their burger undoubtedly is one of the best in town, but it’s their amazing chicken and waffle that had me hyperventilating. I’ll go back just for that! Oakland on the east side of San Francisco Bay has gained increasing appeal as a travel destination in recent years. It only takes 15 minutes on the BART before you’re on the doorstep of Picán Restaurant, where Northern Californian urban chic meets Southern hospitality. The humble soul food is beautifully presented and the authentic Southern flavours sing true. You simply can’t go past the fried green tomatoes, the classic shrimp and grits and of course their famous fried chicken. And why not hang out at the bar after your meal to taste some smooth bourbon from their extensive menu? Settle in, there’s 106 to choose from. San Francisco’s beloved Tartine Bakery is still one of the best bakeries in town. Locals and tourists alike are willing to queue for hours to taste these decadent baked goods. The morning buns are soft, the buttery croissants are flakey and the hot-pressed sandwiches are massive! Seats are limited, so best to just grab and go. Bi-rite Creamery is still one of the best ice cream shops in San Francisco. Be prepared to queue if you want to be rewarded with smooth, creamy ice cream made from organic milk. The salted caramel is a no brainer and one of their most popular flavours, followed by balsamic strawberry, honey lavender and roasted banana. They now also offer soft serve made with buffalo milk. Stopping at Mr Holmes Bakehouse for delicious tarts, doughnuts and cruffins (croissant-muffin hybrid) is a must! Be sure to get there early as the line can get excruciatingly long and their baked goods sell out fast. Those jam doughnuts are pillowy soft and the cruffins are good to the very last bite. A cookie shop that opens until 1am on Friday and Saturday nights? Sign me up! Tucked in the Castro gaybourhood, Hot Cookie is a tiny hole-in-wall bakery that solves all your midnight sweet cravings. While the phallic shaped cookies are tempting, it was the chocolate fudge cookie that hit all the sweet spots. Don’t forget to visit Ghirardelli Chocolate and pick up some delectable chocolates as gifts for friends and family back home. Ghirardelli is America’s oldest continuously operating chocolate maker, proudly established here in San Francisco since 1852. A perfect sweet end to a scrumdiddlyumptious trip. What to get a bit more sweet action? Hop on a chocolate tour! In this city, you’d be hard pressed to have the same meal twice. Expedia’s Aussie travellers spend 3-4 nights in this beautiful city so that’s plenty of time to tackle this list. Like I said, use this guide and you’ll need every inch of that stomach space.